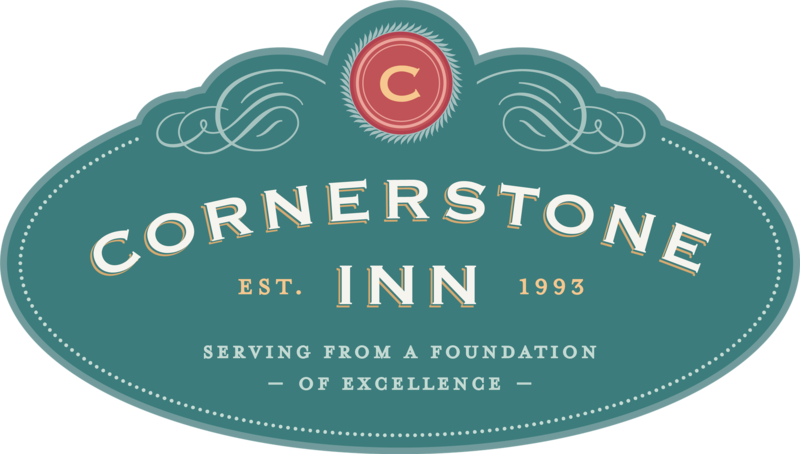 Introducing Cornerstone Lodge - NEW 2018! Adjoins our downtown campus. Package includes all 3 ensuite guest rooms and exclusive use of all common spaces. Let us help you design a memorable group experience at Cornerstone Lodge! Call 888-383-0300 or email: Gathering@CornerstoneInn.com for pricing and availability. 3 private guest rooms with exclusive use of all common areas. The Dwight Steininger Room, Lodge #1, downstairs, features a king bed with Country Classic furnishings. Private bath with shower. TV and Blue Ray DVD Player. For 2 people. The C. Curry Bohm Room, Lodge #2, Premier Suite, upstairs, features a king bed, vaulted ceilings, stained glass, and a luxurious private bath with custom designed shower. TV and Blue Ray DVD Player. For 2 people. The Kafoure Room, Lodge #3, upstairs, features a king bed, private bath, great view of Cornerstone Courtyard with easy access to community loft sitting area and deck. TV and Blue Ray DVD Player. For 2 people. Two-story, double-sided Brown County stone fireplace highlights the ground level great room. Perfect space for casual conversation, corporate brainstorming, watching a movie or just being. Fully equipped kitchen. Refrigerator with ice maker, microwave, stove/oven, dishwasher, cookware, many prep tools, dishware for up to 12, beautiful serving pieces. Lovely, very large patio overlooks the Cornerstone Cottages Courtyard and gazebo. Perfect for parties or just hanging out. Barbeque grill, pass through window to kitchen, tables, and seating for 14. Multipurpose loft area opens to large deck. The loft can be set auditorium style for up to 25 persons. Tables are available for crafting retreats. Great space for meetings, crafting retreats, yoga classes or......?